Antony and Cleopatra. clocking in 3 hours and 30 minutes is a tale of two halves (you really do only get one interval). The first half is lavish in its set designs but lacking in narrative clarity whilst the second half is much more basic in design but the direction and narrative are much clearer. The problem isn’t necessary the production but the source material. William Shakespeare understandably expects us to know the background of this Roman tragedy but I am not sure Simon Godwin who directs should expect that kind of knowledge. Without productions of Julius Caesar and Imperium (Parts 1 AND 2), I would have been baffled. We begin in Egypt Marc Antony (Ralph Fiennes) and Cleopatra (Sophie Okonedo) are living the life in Hildegard Bechtler beautiful Egyptian palace set. She is Queen, he is a successful army commander and the news that his wife Flavia has died should bring them joy, unfortunately, it sets off a catalyst of events that end in tragedy. Okonedo’s Cleopatra is spoilt and indulgent. She looks amazing in Evie Gurney’s Costume designs but along with Fiennes, they struggle to build up the sexual chemistry needed to make this pairing work. They act well together but they often feel like close friends rather than lovers. I am not sure I was ever convinced that anyone would go gaga over Fiennes’ Marc Antony. The issue across the whole production is the lack of characterisation. We have no understanding of why the characters are doing what they are doing; if it is for love then we don’t feel it from our leads, if it is for power struggle then Tunji Kasim doesn’t have the gravitas or presentation of the language to make Caesar a force to be reckoned with and it feels like a series of sketches rather than a coherent story; Antony marries Octavia (Hannah Morrish), Caesar’s sister to keep Caesar happy, then the marriage breaks. Now they are drinking on a boat. There is just no purpose. The whole endeavour feels thankless, to both audience and cast and creative team. What this production has is quality actors in supporting roles. 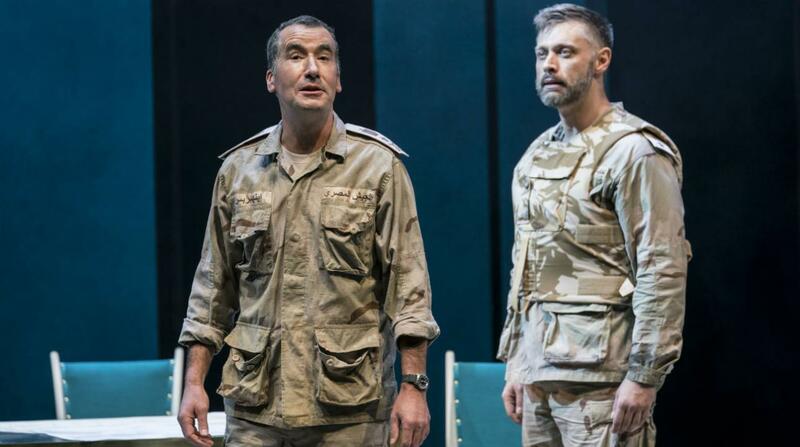 Tim McMullan manages to command the stage as Enobarbus, having the chemistry with Agrippa (in a gender reversal played by Katy Stephens) and his final scenes are strangely moving. It is a shame to see actors like Fisayo Akinade and Nicholas Le Prevost not used to their full potential as Eros and Lepidus. As a production it often felt confused; the contemporary costumes would work better if we had a real sense of time and place. The early comparisons to the European Migrant Crisis which saw many Africans head to Italy were soon forgotten. This production should be saying something and it manages to say nothing. There is some lovely sound from Christopher Shutt, particularly in the Egyptian scenes and Luke Halls video design, when used, is used to great effect but not even the arrival of an adorable and well-behaved milk snake can make this production feel relevant and exciting. It was one of the few occasions where I felt I was watching a production rather than story unfold. I totally agree. Reading reviews I felt I had seen a different version. 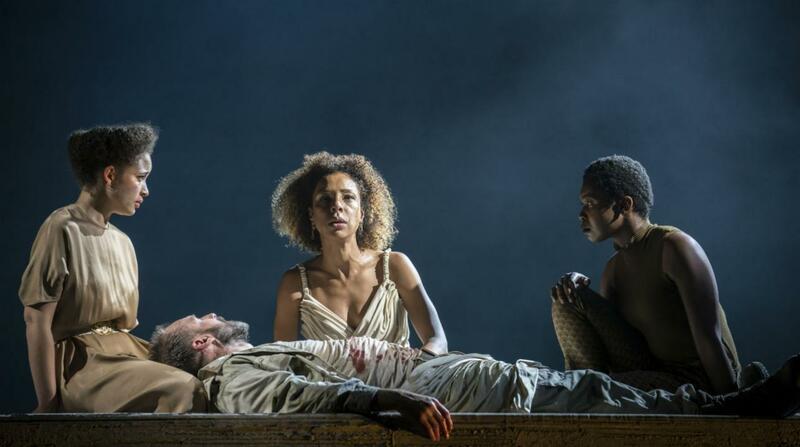 For me there was no chemistry between Sophie Okonedo’s Cleopatra and Ralph Fiennes Marc Anthony. I thought Cleopatra in this production did a lot of shouting. I wanted to see sexiness and seduction from Cleopatra who was powerful (no need to shout to get that characteristic) after all she seduced Marc Anthony. I too thought Ralph Fiennes was more of a friend than a lover. Infact they did not convince me. The production was just not exciting. I am so pleased to find someone else who thought the same as me.